The Colorado U.S. Senate race has ushered some of the most absurd pandering to women maybe ever, but if the election were held today, it wouldn’t just be women who swayed the results, but Coloradans over the age of 55, according to Magellan‘s breakdown. See the chart below that compares ages of ballots returned. 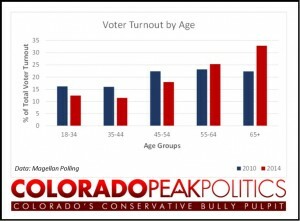 Before you get too excited PeakNation™, older voters notoriously vote early and younger voters notoriously late, so don’t be surprised if the numbers normalize by Election Day, but the missing youth vote certainly could be making the left nervous. That said, in terms of raw numbers, Republicans have turned out 3,000 more in the age group of 18-34 than Democrats have anyway. As of this morning, 199,677 Republicans over 65 had turned in ballots. In contrast, just 154,164 Democrats over the age of 65 have turned in ballots. With Republicans ahead in turnout by approximately 112,000 votes, the lead among older Coloradans contributes 45,500, or about 40%, to Republicans’ lead. Either way, the current statewide turnout (R=40.5%, D = 32.4%, and U = 27.1%) is beating 2010 numbers (R = 39.5%, D = 33.6%, and U = 26.9). In 2010, our top of the ticket had been badly damaged, and Dan Maes and Ken Buck lost, but Republican candidates Scott Gessler and Walker Stapleton won. This time, it’s the left’s candidates who are badly damaged. Udall is floundering so badly that even his donors are critiquing his campaign – in public. Hickenlooper made some major missteps this summer – many stemming from a meeting with the Colorado sheriffs. Tomorrow is fast approaching, but it would seem that the Democrats’ headwinds from this campaign season are testing the limits of the even the “powerful” Bannock Street operation.